What is the true value of e-procurement? In the case of Bangladesh, it’s a significant financial saving on billions of dollars of essential government tenders. The World Bank backed Public Procurement Reform Project II was an internationally funded multimillion dollar initiative aiming to deliver a more transparent, efficient public procurement process. The national delivery of these reforms offers a powerful case study on the value of e-procurement. Every year Bangladesh spent over US$10 billion on public procurement. These essential government projects utilised an out-dated and manually intensive procurement process. Crucially, the existing system had no essential regulatory framework, lacked vital transparency and oversight, and offered a complex and lengthy process for government tenders. Processing of tenders under the existing system could take as long as 51 days, creating a significant bottleneck to vital national development. The inherent inefficiency of the system, alongside inappropriate use of funds, is estimated to have cost the country up to 1.5% of national GDP annually. Bangladesh’s public procurement reforms took the form of four central pillars of change, with government e-procurement a core part of the solution. The government’s digital e-GP procurement programme was the lynchpin of this nationwide transformation; a digital system which offered clear oversight and procurement pathways for public procurement bodies. It was critically adopted by four key public sector agencies responsible for more than half of the nation’s annual development programme. 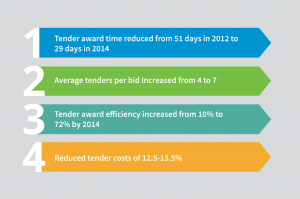 The numbers around engagement tell their own story, but it is the results delivered through e-GP that offer the most powerful insight into the benefits of e-procurement for Bangladesh. In 2007 over 70% of Bangladesh’s tenders were advertised in newspapers. By 2014 fully 100% of all government tenders were advertised online. Independent analysis suggests that this robust use of the e-GP system was saving between 12.5% and 13.5% on government tenders by 2014. That’s a significant reduction for a nation spending an estimated US$10 billion on public procurement, and with a national GDP of just over US$170 billion in 2014. Bangladesh offers a fascinating case study of the benefits of e-procurement on a national scale. Thanks to Procurehere’s simplified e-procurement solution, those same positive results of improved efficiency, increased transparency, and reduced costs, are just as readily realised by your business today.